MAT TO MATTRESS is our latest WIDOW PROJECT. These are the DESPERATE ONES who live in abject poverty. 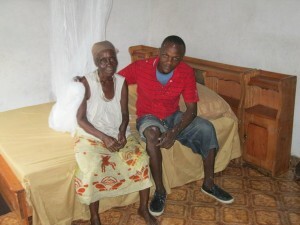 They are elderly and feeble. They have arthritis and often no medication for pain. Many need cataract surgery. These are the ones who have sacrificed for their families. They have often gone to bed hungry to let their children eat. These are the ones who have watched their husbands and loved ones die at the hands of cruel rebels during the wars. What a delight to see our students, who grew up as orphans come to serve these widows! They are Heros in the Eyes of God! 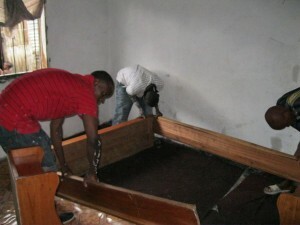 JOSEPH, JAMEL + MICHAEL have come to do the renovations for Ma Mary. They will assemble the new bed, paint her walls and put new flooring down in her room. This will be a complete makeover for Grandma Heah before they leave today. 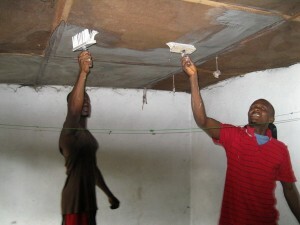 JAMEL and JOSEPH patch the floor, after they have already painted the walls, and the ceiling. Next the boys lay down the new vinyl flooring and finally they assemble the brand new bed! 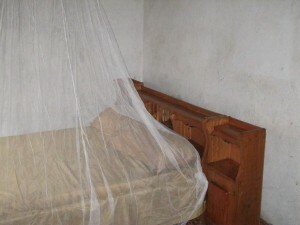 The mosquito net and new sheets are put on the bed. Ma Mary is all too happy for her comfortable bed! I am reminded of the words in Job 29:13 when he says “I made the widow’s heart to sing!” This “extreme make-over” is all done for 300 dollars. 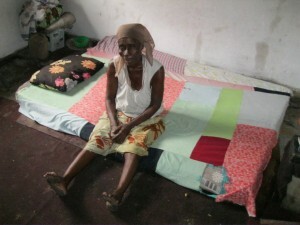 The bed, blankets, mosquito net is 200 dollars. The renovation costs are 100 dollars. Can you imagine the comfort of a bed? Our boys are already very trained at this. They are great painters and very good carpenters. We will keep doing more of these EXTREME MAKEOVERS as the funds come in. What a relief to our elderly!! Or fill out our DONATIONS PAGE and send it along with your cheque or money order. Thank-you for posting these pictures.